Two more shots from my first shift in several months at Salop Goods. 66413 in it's natty new livery Freightliner livery leads 0K83. I used to set this working on its way when working Speke Junction, it clears Garston freightliner depot of its loco's on a Saturday morning prior to it closing its doors for the weekend. 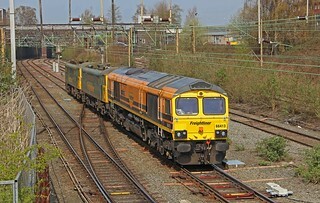 66413 leads 86614 and 86632. 1213 Garston FLT to Basford Hall.